I bought an expensive online plan that has me training chest once a week for two hours. But the growth doesn&apos;t match up. What gives? I&apos;m so tired of reading the same baloney articles and e-books by people who have no business writing them. All of a sudden, every person with an Instagram account is an online trainer. The punk who finished 15th at the Boondock Classic wants to charge you for a plan to achieve his glorious physique? Come on. Even worse, what you&apos;re getting for your $69 "Gold Membership" isn&apos;t anything new. It&apos;s the same old split, only with longer, more pointless workouts! Until you retire and start living in the gym, this just isn&apos;t going to work. And even then, there&apos;s a better way. If a bigger chest is your priority, act like it! Train that muscle group more often, not just more intensely. Don&apos;t worry, you won&apos;t need to carve out another two-hour block in your social calendar, either. Intense and short is the way to go. Here&apos;s how to do it. Training our muscles causes soreness and fatigue—stop me if you&apos;ve heard this one before. This soreness usually lasts significantly longer in untrained individuals, but if you&apos;re someone who trains on a regular basis, you should feel pretty recovered after about 48 hours. Most of us recover within 48-72 hours after training, but we don&apos;t hit chest again until Monday rolls back around. So, why do we wait so long between chest sessions? I have a better idea. How about we train chest again 72 hours after our first session? By incorporating a chest day into your routine, you&apos;re essentially increasing the number of your chest workouts from 52 sessions per year to 104. Sounds like a lot of gains to me. I can already hear the keyboard ninja typing in his mom&apos;s basement: "That&apos;s impossible! You have to be on steroids to recover like that!" No, you don&apos;t. You just need to plan your training and nutrition properly. If you can&apos;t properly recover from a training session in 72 hours, you are training incorrectly. 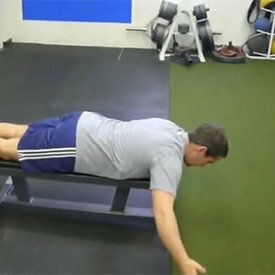 I&apos;m 100 percent certain that benching for quality reps twice per week will be more beneficial than a two-hour chest marathon once per week. Think of it this way: By incorporating a chest day into your routine, you&apos;re essentially increasing the number of your chest workouts from 52 sessions per year to 104. Sounds like a lot of gains to me. One nice thing about a weekly chest day is that you can try to push monster weights every time you train. That doesn&apos;t apply here. You simply shouldn&apos;t train as heavy as possible twice per week. Even real-deal powerlifters alternate their training. 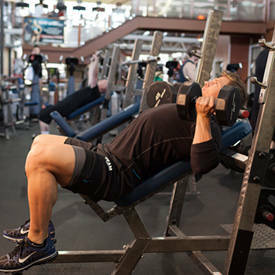 The trick to training a body part twice per week is to concentrate on moving heavy poundage for fewer reps on one day, and spend more time under tension with less weight on the other day. The workouts are still plenty intense, just in a different way. The trick to training a body part twice per week is to concentrate on moving heavy poundage for fewer reps on one day, and spend more time under tension with less weight on the other day. On the days I use lighter weight, I like to lift with tempo. That means I slow the lift down and control it from every aspect. Tempo training is usually expressed in three numbers: 3:0:1, for example. 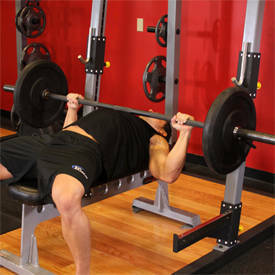 So if you&apos;re doing the bench press, take three seconds to lower the weight, don&apos;t pause at the bottom (zero seconds), and then explode up for one second. I also like to combine accessory muscles with major muscle groups to keep the workouts intense and short. 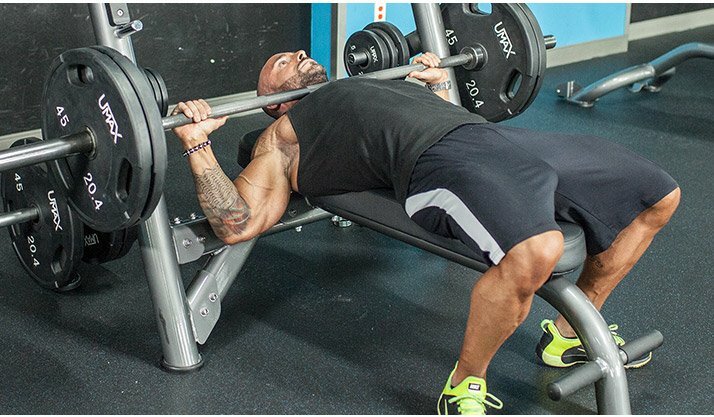 I use this workout on my lighter chest-and-shoulder day. 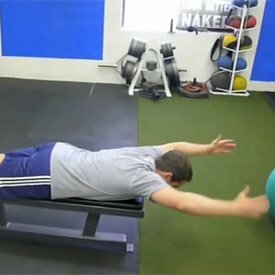 The goals of this workout are tempo and time under tension (TUT). I utilize tempo and dropsets or giant sets to increase TUT. This workout will be brutal, but it will not be so taxing that you&apos;ll need an extra-long recovery period. Every lift should be done with submaximal weight.